Despite the continuing decline in the people’s satisfaction and approval of his performance as President, Benigno S. Aquino III claims that he is not worried. “I’m really not concerned with the popularity. It will go up and down,” Aquino said in reaction to the latest survey of the Social Weather Stations (SWS). The SWS reported that the net satisfaction rating of the President fell to +46% in June from a high of +64% in November 2010. A separate survey by Pulse Asia also shows a similar trend. The approval rating of Aquino dipped to 71% in May from 79% in October 2010. Aquino, however, is missing the point. The issue is not popularity. What exactly are the grievances of Aquino’s supposed boss? Thus, if President Aquino is facing a decline in the SWS and Pulse Asia performance surveys, it’s not because of bad public relations. It’s not simply “a weakness in messaging” as Aquino put it. The emerging trend in his satisfaction and approval ratings as President is about policy. People expected him to address their most urgent issues – livelihood, jobs, and prices. After a year, he has not only failed but even exacerbated the plight of the people. Just how bad is the situation? According to SWS in its March 2011 survey, 11.3 million workers are jobless. That’s almost 3 out of 10 Filipino workers. The intensity of joblessness has doubled in the past two decades. The average rate of unemployment in 1993 (first time SWS measured joblessness) was just 13.6%. Today, that number has soared to 27.2%. The SWS also said that 1 out of 4 families experience hunger and that more than half consider themselves poor. That’s 10.4 million poor families, of which 4.1 million go hungry. The first time SWS conducted its hunger survey in 1998, the hunger incidence was 11% of families. By 2011, it has almost doubled to 20.5%. That is the magnitude of the problem which long-term trends show is deteriorating. Yet, all Aquino can offer are pantawid measures. For the poor and hungry, he has the Pantawid Pamilya. For the lowly tsuper battered by oil price hikes, he has the Pantawid Pasada. For the jobless, he has the pantawid trabaho also known as Community-Based Employment Program (CBEP). But the scale of joblessness, hunger, and poverty is too great for pantawid measures to matter even when properly and fully implemented. Pantawid Pamilya, for instance, excludes 8 million poor families, including almost 2 million families who have difficulty affording a need as basic as food. The Pantawid Pasada, on the other hand, has already become meaningless even before it can take off due to continuing OPH. (Read here) Not to mention that it excludes everyone else hurting from soaring oil prices. The CBEP, meanwhile, aims to generate 1.1 million jobs this year, less than 10% of the estimated number of unemployed. These jobs are all temporary, of which almost 63% are in infrastructure. Despite the low quality and temporary nature of these jobs, the Aquino administration is still having a hard time generating them. With just six months left for the year, the program has generated just 170,000 jobs – 15% of the target. A fast and sustainable way to generate productive jobs massively is to dismantle the haciendas across the country for landless farmers to till. But the haciendero President doesn’t even want to talk about Hacienda Luisita and genuine land reform in his major policy speeches. Worse, Aquino’s pantawid programs are not only gravely inadequate even as relief measures. His main policies are also gravely anti-poor. He ordered the National Food Authority (NFA) to hike the price of its rice by P2 to 4 a kilo. The move was part of the gradual privatization of the agency’s functions. Aquino also refused to control spiraling prices and ignored calls to scrap the 12% value-added tax (VAT) to at least mitigate the impact on consumers. That will turn-off investors and creditors, he said. Meanwhile, to promote his public-private partnership (PPP), he allowed the foreign operator of SLEX to jack up its fees by 300% and approved a fare hike of as much 100% in LRT and MRT. Aquino even promised potential PPP investors that they should not worry about the courts, Congress, or regulators. Filipino taxpayers will shoulder the cost of their guaranteed profits through regulatory risk guarantee. The NEDA is now pushing for an amendment of the BOT Law to implement this. 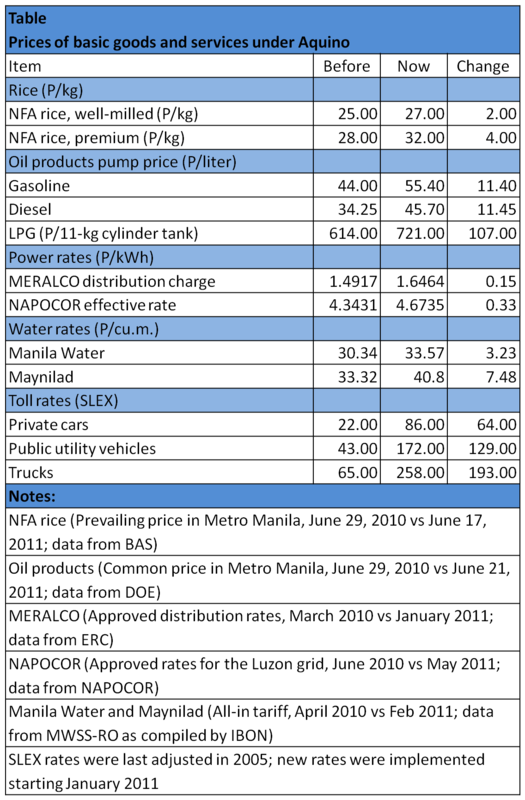 Aquino’s concern for big business interest – oil companies, power firms, toll operators, prospective PPP investors, etc. – is only matched by his indifference to the working people’s demand for decent wages. He refused to show political will and help workers secure a substantial wage hike through legislation. In the end, wage earners in Metro Manila did not get a wage hike but a measly P22 cost of living allowance (COLA) from the regional wage board. Workers in the Eastern Visayas got a P23-pay adjustment (P8-wage hike and P15-additional COLA). But these adjustments – which workers in other regions did not enjoy – are so small and not enough to buy even a kilo of NFA rice. Nationwide, minimum wages are not even half of the amount needed for an ordinary family to live decently. That is, if they still have a place to live. Demolition of urban poor communities has been intensifying under Aquino. The moratorium he promised to beleaguered informal settlers never came. In Metro Manila alone, 6,000 urban poor families have already been displaced in the first year of Aquino. That’s only a partial tally made by BAYAN-NCR. Read more, download BAYAN’s paper and Powerpoint presentation on the national situation. 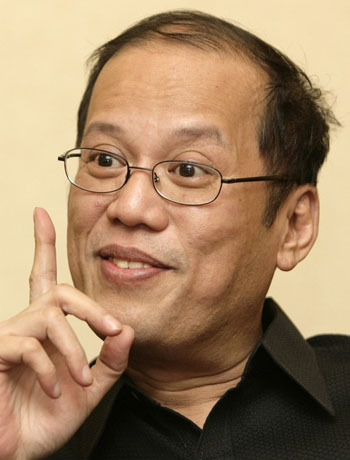 → Aquino’s “Pilipinas Natin”: Pilipinas nino?